Back with more from the CFS! After the show gardens, the Great Pavilion is probably the main attraction of the show. For true gardeners, this is the heart of the show, since it is in fact a flower show despite being better known now as a garden design show. The Great Pavilion is the place where nurseries and various societies from around the world get to showcase their plants. Everything from hundreds of roses in the David Austen Roses display, to fungi from the British Mycological Society, exotic cacti, japanese maples, bonsai, grasses and many, many more. The most amazing part is just incredibly perfect every single plant is. 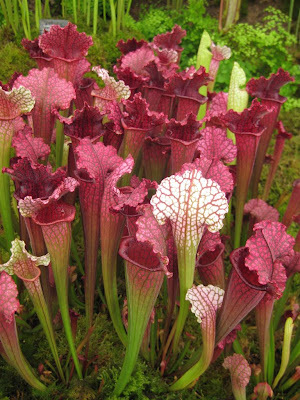 There is not one flaw on any of them - including the carnivorous plants below which were very interesting and were put to dramatic use in the wetland show garden I showed in the last post. It must take an incredible amount of work and planning to have all these plants ready for just one week in spring. There were several impressive displays. I really loved the Kirstenbosch, South Africa display - they had some amazing plants (again grown to perfection) that you don't get to see every day. 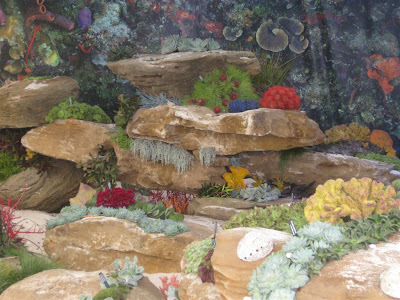 The Cayman Islands Dept of Tourism and Newington Nurseries had a very creative display designed as an underwater landscape but obviously just using regular non-aquatic plants. They did great job with plant selection and lighting - not sure that the picture really does it justice. I think this one got a Gold Medal. Some nurseries put together really elaborate displays featuring hundreds, if not thousands of plants, like Roger Platts Garden Design and Nurseries. Jekka's Herb Farm also did a great job using only medicinal herbs for their display. After many long months of waiting and counting down, the big day finally arrived last week: my very first trip to the Chelsea Flower Show! Chelsea was as big, grand and inspiring as I was hoping it would be. One of the things I was really struck by was just how seriously this event is taken in the UK. The large grounds of the show were teeming with BBC camera crews doing spotlights on gardens, shows with celebrities (OK, “celebrities” in the gardening world) and interviewing visitors. Every other conversation I overheard was about how that garden looked smaller on TV, or what was said about this garden on a show. And the Chelsea buzz is not just at the show – even as we were visiting gardens outside of London for the long weekend, references to Chelsea were popping up everywhere. Overall, I was impressed with how prominent the show is and the exposure it gets. Now to the show itself – I could probably do about fifty blogs on it. We arrived there 5 minutes after opening (although we’d planned to be there earlier! ), and I couldn’t believe how many people were already there. For a standard show, it would be considered full. We immediately ran over to the “Main Avenue” where the large show gardens are, so we could have a peak without 10 people in front of us. The show gardens were really impressive. It’s remarkable how established and fully mature they can look after only being set in place in the last two weeks. This ain’t no Canada Blooms – no pots of the same hydrangeas or forced bulbs in every garden, poorly hidden in mulch. Plants included everything you can possibly think of, from gigantic trees to wildflower meadows, all perfectly planted with not a hint of artificiality. And of course the water features, hardscaping and other features were all very impressive. Granted, the timing of the show in late May makes this much easier. The gardens also benefit from a backdrop of beautiful, huge trees on the Chelsea Hospital grounds rather than a bleak indoor show hall. The garden I was most impressed with was the “Wetland Garden” (sponsored by the Foreign & Colonial Investment Trust) pictured above. It had an incredibly natural feel, combined with original design elements. I think it achieved a perfect balance between the natural world and human touch, in a way that is pleasing and comfortable as a garden. It’s inspiring to think that with a little bit of effort, this could actually be in your backyard, to enjoy every day. Another garden that I think achieved this balance perfectly was a small urban garden designed by Angus Thompson & Jane Brockbank. The garden takes inspiration from "memories of forgotten corners in larger gardens". Ahh.. to have a forgotten corner like this one. 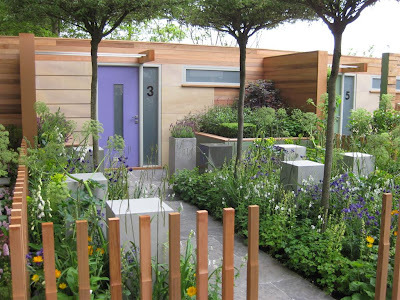 Other nice gardens were the Daily Telegraph Garden, which won Best in Show and was designed by Swedish landscape architect Ulf Nordfjell. 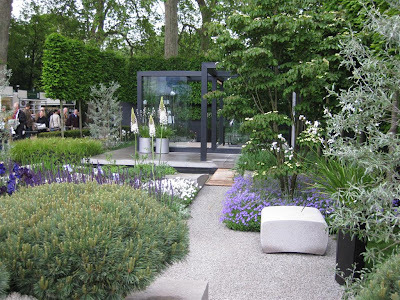 The Laurent-Perrier Garden done by first time Chelsea designer Luciano Giubbilei. And the Marshalls "Living Street" garden showing four different front gardens. Of course everyone talks about trends that were highlighted at Chelsea. I’m not sure what the official trends were, but I was struck by a few things. First, the very natural planting schemes in many gardens, using more common and natural, non-hybridized flowers was refreshing. Second, the use of colour was very good and clearly something that was paid close attention to in all gardens. I know we’re always told to do this, but it’s hard and it was nice to see it well done at Chelsea. I loved a lot of the gardens on a mostly green theme, but also some of the darker foliage gardens which were very well arranged. Well, that was a long post and it only takes us through the large show gardens! I'll be back with more from Chelsea soon! 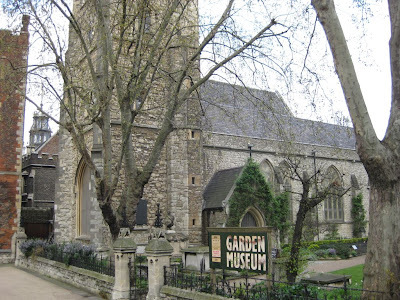 The short advice about the Garden Museum in London is: skip it! I’m sorry to say this, since I was obviously eager enough to make the trek out there and pay my 6 GBP. What gardener wouldn’t be excited at the prospect of a museum paying homage to all things gardening right in London, one of the world’s great gardening capitals! I was imagining long halls of old landscape plans, Gertrude Jekyll drawings, the history of Britain’s great gardens, journals of accomplished plant hunters, old garden tools and techniques… I could go on and on - there’s so much potential! Instead, the museum is a huge let-down. In fact, it’s amazing just how bad it is. 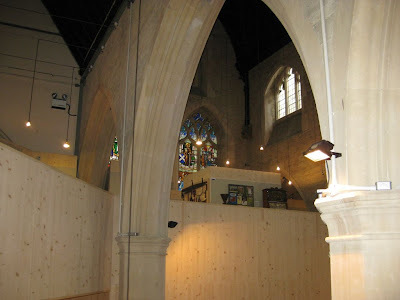 It starts out promising enough – it is housed in the beautiful former Mary-at-Lambeth parish church. On the ground floor, there is the all important gift shop – probably the best stocked part of the museum, which is not saying much since it’s nothing special. At the time of our visit, there was also a Beth Chatto retrospective on the ground floor. This was small but nicely arranged and interesting, especially because I’m a huge fan. Pictures of her and her garden, some journals, and a slide show with beautiful shots, although slide changes were terribly slow. Next, we proceeded to the main part of the museum upstairs. Unfortunately, I’m afraid calling it a museum is excessively generous. It is a single room, and a small one at that (the entire museum is in the picture above). And the prized collection stored in this single room? 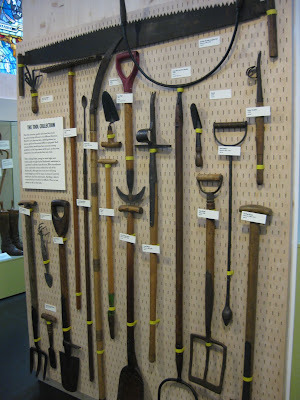 Garden tools strikingly similar to what you will find in almost any gardener’s shed. Really, I’m not kidding. That shovel from your grandfather? Yes, you can pay 6 GBP and see it again at the London garden museum. And not much else. There are about half a dozen display cases, with tools, a seed machine and some mildly interesting memorabilia. That is it! Once you’ve taken your 10-15 minutes to look through this, and are ready to go on, you will be surprised to discover that there is nothing to go on to. In fact, we kept going around and around the room to look for the secret passage leading to the main part of the museum. Alas, as also confirmed by the front desk volunteer, this is all you get. The “sneak peak” at the collection offered on their website is pretty much the whole collection. 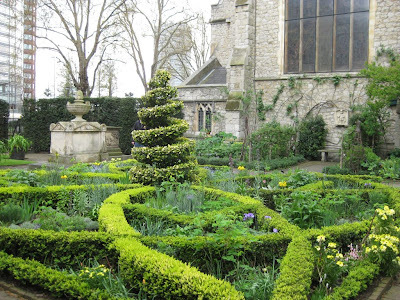 Oh, I shouldn’t forget the small 17th century knot garden in the courtyard of the museum. This is quite pretty with a nice feeling of enclosure, but very small. The grave of the Tradescants family, gardeners to Charles I and famous plant hunters who have lent their name to several popular garden plants is also here. Too bad there is no other information about them in the museum. Overall, a huge disappointment and definitely not worth the time or the money. It’s really a shame! When: Open year-round, check opening times on website. Since I have been become a little addicted to taking garden photos and have been having a hard time deciding which to post on the blog, I've also opened a new Flickr account where I can post more photos. 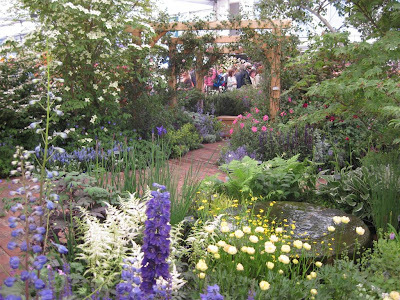 The account is also in anticipation of the CHELSEA FLOWER SHOW, where I'm sure I will go overboard with the pictures. By the way, the CFS is only 2 days from now!!! Or at least my visit - the rich and famous have already attended the gala opening and awards have already been made public. The Flickr account is www.flickr.com/thegardenwanderer. I have posted Keukenhof pictures, as well more from the Savill Garden (they didn't turn out fantastic though) and the Hamamelis Festival at Kalmthout Arboretum in January. More to come soon! 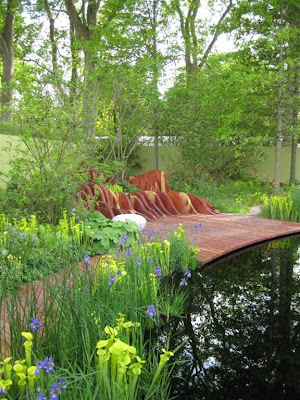 In just under one week from now, I will be at the Chelsea Flower Show. THE Chelsea Flower Show. I’ll just let that sink in for a little bit. 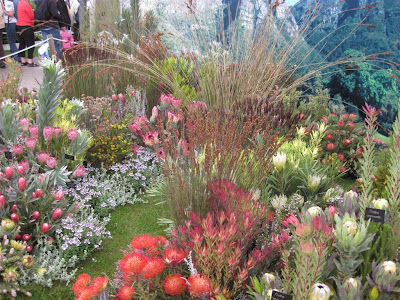 In the very unlikely case that you are not familiar with the Chelsea Flower show, it is nothing less than the greatest flower show on earth. It’s the gardening world’s equivalent of the Oscars. The thought that I will actually have a chance to witness it firsthand is almost overwhelming. I hope I make it to next week. 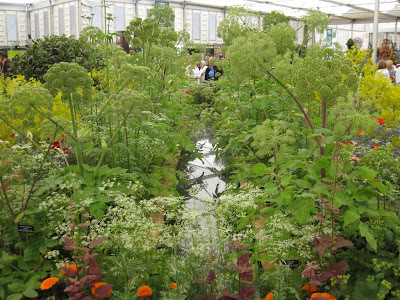 Chelsea is where the gardening world assembles every spring to strut their stuff, have a peak at latest and greatest in horticulture, and hand out prestigious awards. It sets the gardening trends for the year, brings new designers and concepts into the spotlight, and previews all new things in gardening. Yes, gardening is that fashionable when it comes to Chelsea. The show features many things, but probably the most famous are the large show gardens, which have gotten more and more extravagant over the years. They are sponsored by large companies, charities, or even royalty. 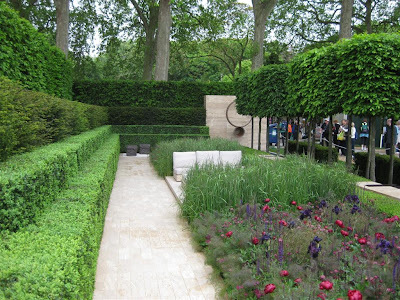 During the week of the show, the whole Chelsea Hospital grounds are transformed into several fully mature gardens, with extravagant hardscaping, and fully grown perennials, shrubs and trees. Plants are flown in from around the world for this – not very ecologically sound, which is a little ironic given the horticultural theme of the show, but just to give you an idea of the scale of the whole affair. Another showpiece of the Chelsea Flower Show is the Great Pavilion, where exhibitors from around the globe display the latest and greatest in plants. Chelsea is often the first place where many new plant introductions are previewed. And it’s not just about the individual plants, but also about the displays as a whole, which can get quite elaborate. 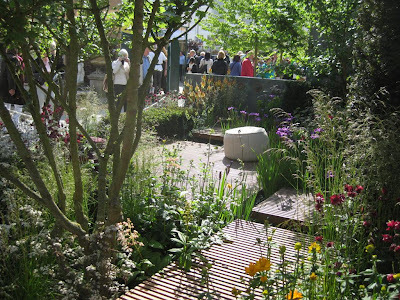 And in case all this is not enough, there are also many other features at Chelsea, like smaller urban gardens, courtyard gardens, floral design and gardening product stands. There is only one slight blemish on my first trip to Chelsea. This year, due to the economic recession, there will be fewer large show gardens than normal - 13 instead of 22 in previous years. Less corporate sponsorship means that even famous designers like Diarmuid Gavin were not able to secure sponsorship. Flemings, an Australian landscaping company which has created some buzz over the last few years will also be absent as much of the their stock was lost in the Australian bush fires. Some exhibitors will also be missing from the Great Pavilion. On the bright side, this may give some new designers a chance at fame and glory as well. And also gives me an excuse return next year! The full report on Chelsea will follow the week after next! The Royal Greenhouses in Laeken are normally reserved for the Belgian royal family, but luckily during three short weeks in spring, the general public gets a chance to enjoy this architectural and horticultural treasure. Needless to say, it's a popular tourist attraction, so expect to bump elbows with a few other interested visitors. 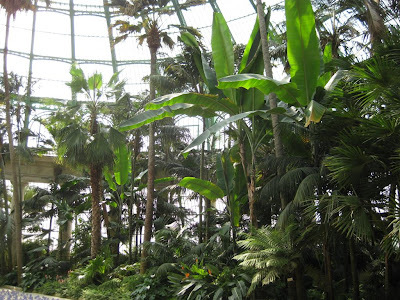 The whole greenhouse complex covers an impressive 2.5 hectares (270,000 sq ft) and is made up of no less than eleven interconnected glasshouses. 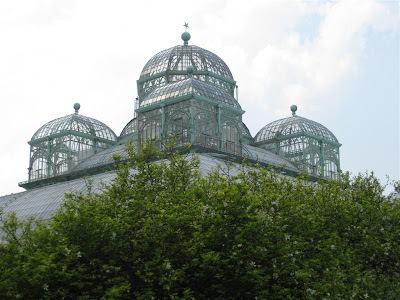 There are several large greenhouses, two major domed buildings with beautiful cupolas, and a long glass walkway that snakes across the rolling landscape. The whole monumental complex is literally a "glass palace", with some greenhouses being used for state receptions, and one of the domed greenhouses known as the ‘Iron Church’ originally conceived to serve as the royal chapel. The whole complex was designed by Alphonse Balat, Victor Horta’s teacher. In addition to the impressive architecture, the complex houses a large collection of plants, from camellias, to clivias to palms. 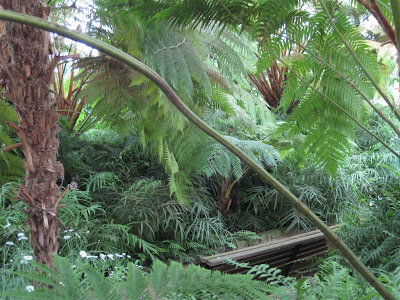 However, I think the most impressive plants are the tree ferns. There must be hundreds of them, all beautifully set in lush arrangements with many other ferns, greenery and flowering plants. Also very impressive are the geraniums and fuchsias. 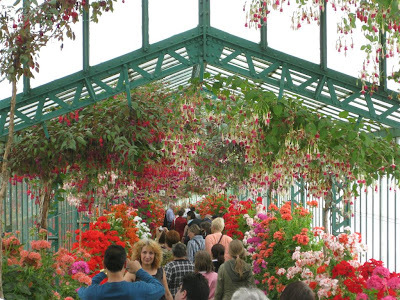 The entire interconnecting walkway greenhouse is completely covered in blooms: six-foot high geraniums along the walls, and tree-sized fuchsias smothering the ceiling. A unique experience, but be prepared for long line-ups and many unavoidable strangers in your pictures. When: Only open for 3 weeks in spring, around the middle of April to beginning of May. Different opening hours each day, so check the website and time your visit carefully. There are many, many visitors, so if you want to avoid impossibly long line-ups, get there before the opening times. Otherwise, it's basically one long packed stream of people slowly snaking through the complex. 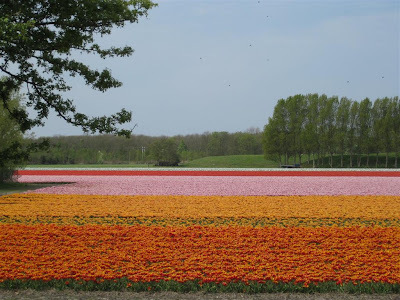 If there is one thing that can compete with the spectacular display of spring bulbs at Keukenhof gardens, it is the commercial bulb fields that surround it. 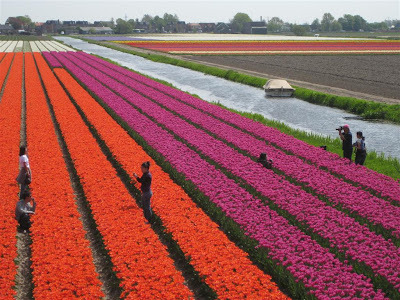 Each year from mid-March to mid-May, 52,000 acres of Dutch countryside erupt in stunning colour thanks to billions of tulips, daffodils and hyacinths. 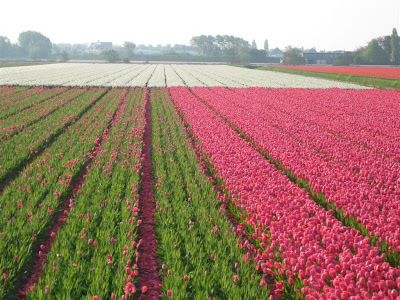 Holland is one of the main producers of both bulbs and cut flowers in the world – an unbelievable 93% of the world's bulbs come from this tiny country. 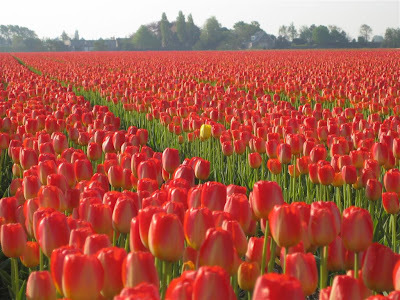 There are about 2,700 Dutch bulb growers, who produce 9 billion bulbs each year. 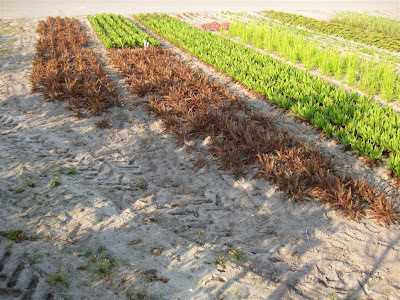 Most fields are destined for the bulb industry, meaning that the plants are allowed to flower and die back naturally in order to grow the bulb. Others are for cut flowers, but these are not as spectacular since flowers must be picked while still in bud to ensure that they are fresh when they reach costumers. The bulb growing area is concentrated in the west of the country around Lisse, which conveniently is also where Keukehof is located. Keukenhof is in fact a showcase for the bulb industry, as most displays in the garden are sponsored by various bulb growers. And while Lisse touts itself as the epicenter of the bulb growing industry, the whole area between Haarlem and Leiden is known as 'De bollenstreek' - the Bulb District. In these parts, many people’s livelihood depends either directly or indirectly on the bulb or flower industry. As a gardener, one of the things I found most astonishing about the bulb fields is the soil, or rather the lack thereof. Of course I was expecting sandy soil in the Netherlands, but this was outrageous – it’s not sandy, it’s actually SAND! Tulips originate in Turkey, and like dry summers and winters. The well-drained sand actually suits them perfectly, and allows them to stay dry even with much more rain than they would receive in Turkey. The bulb field experience is really unique and definitely worthwhile. Instead of being met by fields of green as you go through the country side, huge swathes of land are covered in hot pink, deep crimson or intense blue, sometimes coupled with incredible scent. A surreal experience that both delights and confuses the senses. What: Bulb fields, the Netherlands. Where: Centered around Lisse, but strech from Haarlem to Leiden in the west of the country. When: Mid-March to mid-May, although given that 1/3 of bulbs are tulips and they are later bloomers, the second half of April is probably peak season. The best way to experience the bulb fields is probably by bike. If you’re in a car, you’ll want to stop and take pictures much too often. Just be respectful of the bulb fields – they are someone’s livelihood, and as many signs point out, please don’t walk all over the fields and do not pick the flowers!